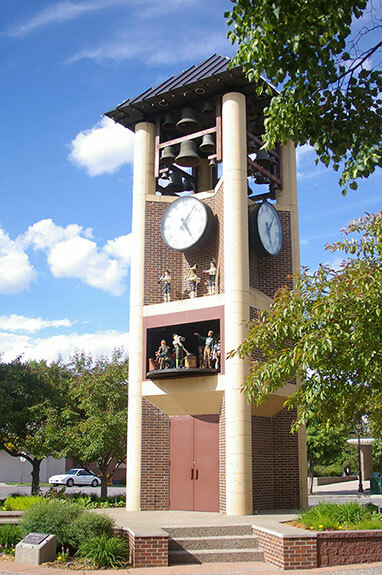 Located downtown, the 45-foot tall Glockenspiel’s bells can be heard chiming throughout the day and playing programmed pieces at noon, 3 PM. and 5 PM. The Glockenspiel houses 37 bells with a total weight of more than two tons. Twelve figurines depicting characters from the city’s history, rotate on a circulating stage during performances. From Thanksgiving to early January, the figurines of a three-piece polka band that stand directly below one of the clock faces are replaced with a nativity scene. It is one of the few free-standing carillons of its size in the world.